Input and output is electrically isolated, so called isolation amplifier. An isolation amplifier is an amplifier in which there is no conductive contact between input and output sections of amplifier. Thus the amplifier offers an ohmic isolation between input and output terminals. This isolation must have low leakage and a high value of dielectric breakdown voltage i.e. high resistance and low capacitance. Typical values of R and C between input and output terminals are R = 10TΩ (tera = 10^12) and C = 10pf. In isolation amplifier there is no ohmic continuity from input reference terminal (input ground) to output reference terminal (output ground). The input common terminal is also independent of reference terminal of power supply (ground for supply). In some cases power supply is also independent from output common. Isolation amplifiers are available in IC form. They can be used for precision sensor signal conditions provided they include isolated power supply. In isolation amplifier the coupling method between input and output is optical. The most often isolation amplifier contains an input amplifier of gallium arsenide (GaAs) LED and a silicon photodiode an output amplifier. The following figure shows such configuration of isolation amplifier. Input and outputs are electrically isolated from each other. 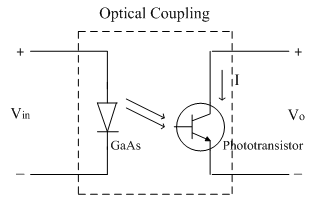 They are optically coupled. LED emits light and it is detected by a photodiode at output. According to input signal, light emitted by LED changes i.e. intensity of light is variable. This is detected by a photodiode at output and generates a photocurrent at output. Therefore light emitted is proportional to photocurrent generated. The signal from output is further amplified by amplifier. The signal from input is optically transferred to output side providing electrical isolation and hence the name.